This workshop focuses on increasing understanding among consumers of Europe’s energy transition and the technologies that will be used to facilitate it. Easy to understand explanations and materials are a first and crucial first step towards acceptance and engagement in our new and smarter energy system. With this in mind, EDSO and ESMIG have initiated an online consumer campaign aiming to explain smart metering, smart grids, their practical applications and benefits from the point of view of everyday households. 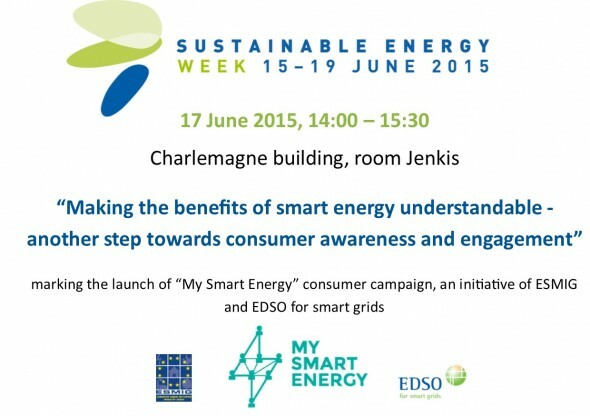 The EUSEW workshop will mark the official launch of the first phase of the “My Smart Energy” campaign. Participants will hear the experiences of existing consumer awareness efforts and will be invited to contribute to a consultation aimed at exploring the best way forward for a potential second, and more far reaching, phase of the My Smart Energy campaign to maximise its usefulness for consumers and society. The workshop will take place in the framework of the European Sustainable Energy Week (EUSEW) from 14:00 to 15:30 on 17 June at the European Commission Charlemagne Building, Jenkis Room.